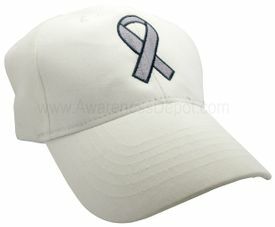 This Brain Cancer Awareness Baseball Cap is a great way to show your support for someone struggling with Brain Cancer. Each white cap is made from all cotton and is soft and flexible with an adjustable strap in the back. A gray ribbon is embroidered proudly on the front of the cap.